By Charles Strouse. Arranged by Fishel Pustilnik. Lead Sheet, Score, Sheet Music Single. 8 pages. Published by F & N Enterprise (H0.129421-840371). 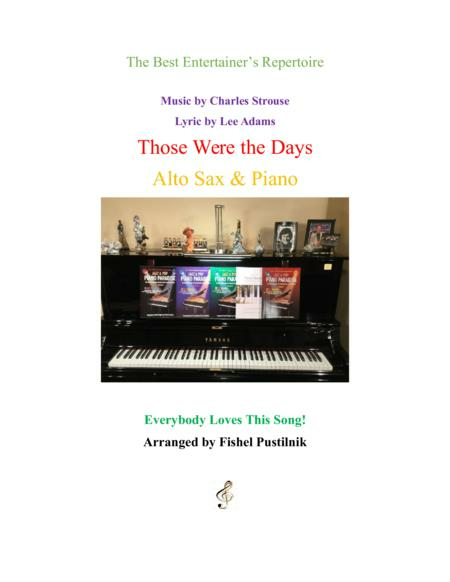 "2016 Arranging Contest Entry" An excellent arrangement of famous Song "Those Were the Days" for Alto Sax and Piano. The composition is easy to read, fun to play and sound professional when performed. 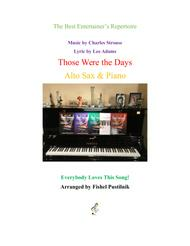 Arranged by Fishel Pustilnik, very well known as Composer/Publisher. His books "Jazz & Pop Piano Paradise" have become a commercial success and a hit with music teachers and students in Canada. (Thousands books already sold in Canada). They are also starting to enter the US, Brazil, Norway, Russia, Holland, Israel, Belgium, Sweden, Finland, Greece, Latvia and UK markets. ”This is a wonderful new publication. These pieces offer much appeal for the young pianist and excellent choice for a supplementary book for students from Grade 3 to 8.” Lore Ruschiensky, Editor, (from review in “The Canadian Music Teacher”) “Yesterday I spent at least two pleasure filled hours playing through your imaginatively inventive compositions. Congratulations! I trust students will decide to program your well crafted and entertaining works on recitals and examinations." Review from Dr. Jack Behrens, B.Sc. (Julliard), PH.D (Harvard), Director of Academic Studies, The Glenn Gould School "I liked this book the best so far. Great work! You have a gift for melody and your arrangements are very playable. Congratulations on the 3rd Volume”. Mark Carlstein, Hal Leonard, Keyboard Publications.﻿.